The Botanical Garden of the Ozarks is open seven days a week from 9 a.m. to 5 p.m. We are located at 4703 N. Crossover Road in Fayetteville, Arkansas. BGO Members are always free! Fayetteville residents are admitted for free on Saturday mornings from 9 am to noon. Please be sure to check-in at the Visitors Center before entering the garden. Enjoy the many benefits of membership by joining today! Please do not pick, collect or eat plants, seeds, flowers, fruits or vegetables. We welcome service animals, but please leave pets at home. The garden is a tobacco-free campus. Smoking and tobacco products/devices are not permitted. Bicycles are not permitted and may be parked on the racks in front of the garden gate. Please stay on paths and turf areas, including inside the Butterfly House & Pavilion. Picnicking is permitted in designated areas. Drones: Unmanned aircraft are prohibited from launching, landing or being operated on garden property unless a permit has been secured from BGO staff. Recycling and trash bins are available throughout the garden. Please dispose of your waste in the proper bins. Professional/commercial photographers, please review our photo permit policy. 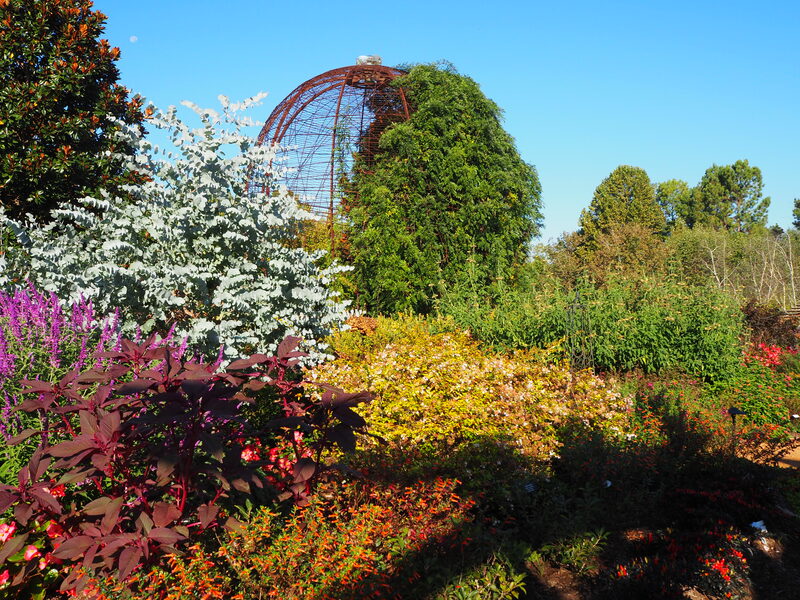 Explore the beauty of the Ozarks at Northwest Arkansas’ only botanical garden! The Garden has two wheelchairs available to visitors at no charge. Just ask the volunteer greeter, and he or she will be glad to help! Note to visitors using electronic navigational devices or online mapping tools: though the Garden is in the City of Fayetteville, the ZIP code assigned to us is 72764, a code serving addresses in the City of Springdale. 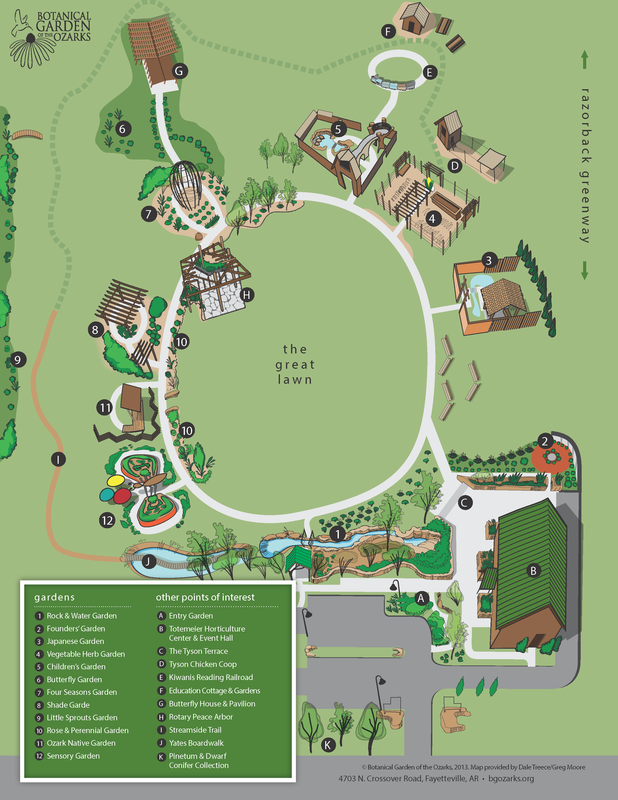 Your software may recognize “Botanical Garden of the Ozarks” as a destination in Springdale. Take EXIT 70 (Don Tyson Parkway). Turn LEFT on Don Tyson and continue on until the Hwy 265/Crossover Road intersection. Take a right. Our entrance will be on the right. Look for our native stone sign and the brown timberframe building. Take EXIT 67 (Highway 71-B, Fayetteville Business District). As the exit joins Hwy 71-B North, merge into the right-hand lane. At the third set of stoplights (in front of the Northwest Arkansas Mall), turn RIGHT on Zion Rd. Follow Zion Rd. until it ends at Crossover Road (Hwy. 265) and turn LEFT. The Garden is on your left in half a mile. Look for our native stone sign and the brown timberframe building. Take Old Missouri Rd (Hwy. 265) South. Pass the Springdale Municipal Airport and cross Hwy. 412. Just after the Fayetteville city limit sign, you’ll go over a hill. The Garden entrance is the first drive to the right. The distance from the intersection of Hwys 412 and 265 to the Garden entrance is 2.1 miles. Head east on W. Mountain Street and turn LEFT on Hwy. 71 B. Travel north for 4.5 miles to Zion Rd. (in front of the Northwest Arkansas Mall), turn RIGHT on Zion Rd. Follow Zion Rd. until it ends at Crossover Road (Hwy. 265) and turn LEFT. The Garden is on your left in half a mile. Look for our native stone sign and the brown timberframe building. Highways 16, 45, and 412 each intersect with Hwy 265. Highway 412 intersects with Hwy 265 at the Springdale Municipal Airport. Turn LEFT (South) on Hwy 265 (Old Missouri Rd). Just after the Fayetteville city limit sign, you’ll go over a hill. The Garden entrance is the first drive to the right. The distance from the intersection of Hwys 412 and 265 to the Garden entrance is 2.1 miles. Highway 16 intersects Hwy 265 in Southeast Fayetteville. Turn RIGHT (North) on Highway 265. The garden is 5.9 miles north of the intersection of Hwys 16 and 265. Highway 45 intersects Hwy 265 (Crossover Rd.) in East Fayetteville. Turn RIGHT (North) on Highway 265. The Garden is 3.5 miles north of the intersection of Hwys 45 and 265. 65 (Crossover Rd.) in East Fayetteville. Turn RIGHT (North) on Highway 265. The Garden is 3.5 miles north of the intersection of Hwys 45 and 265.